ORGANIC MOSO BAMBOO CUTTING BOARD; looking for an eco friendly replacement for plastic cutting boards? Our large Moso Bamboo Cutting Board combines natural anti-microbial protection, non-slip feet and a premium maple butcher block design for a great, eco friendly Organic Cutting Board! FORMALDEHYDE FREE; our premium boards are manufactured without the use of formaldehyde - a carcinogenic. While inexpensive products may contain this cancer causing substance. ANTI MICROBIAL PROTECTION; perfect for meat preparation, our Cutting Board is naturally rich anti-microbial "Bamboo Kun", producing an ultra hygienic surface that won't harbour harmful bacteria, perfect for meat, vegetables and fruit! PREMIUM DESIGN; hanging cut-out for easy air drying and finished in a premium, ultra smooth Maple butcher block striped design for an attractive natural, eco friendly addition to every kitchen set! ECO FRIENDLY MOSO BAMBOO; constructed the finest Moso Bamboo, one of the fastest growing bamboo sources on earth, growing up to a meter each day producing an environmentally friendly, easily sourced material! Click the Orange Button to order now! ORGANIC BAMBOO CUTTING BOARD: ECO FRIENDLY, NATURAL BAMBOO WITH PREMIUM ANTIBACTERIAL PROTECTION! Do you prepare a range of fresh foods and family meals, but find most cuttingboards dull knives and are tough to clean? Would you like a large cutting board with a great design to match everykitchen set? If so, ZestyNest's Organic Moso Bamboo Cutting Board is the perfect, ecofriendly, choice! Manufactured from premium organic Moso Bamboo, our CuttingBoard provides a large cutting surface which preserves the sharp edges ofknives while offering the tough, robust strength of expensive European Oakboards. Ideal for preparing vegetables and meats, our 100% Moso Bamboo Cutting Boardis rich in "Bamboo Kun", a naturally occurring, potent anti-microbial agent tohelp prevent the build up of harmful bacteria for hygienic, everyday mealprep! Our Cutting Board has been designed with dual juice grooves for mess freecutting, together with four non-slip raised feet and a large, hanging cut outfor convenient storage and thorough air-drying, finished with a premium,striped butcher block design! Our Bamboo Cutting Board is a great choice with a number of key benefits: -Tough, solid Bamboo construction, won't easily dull knives. -Rich in naturally occurring, anti-microbial Bamboo-Kun. 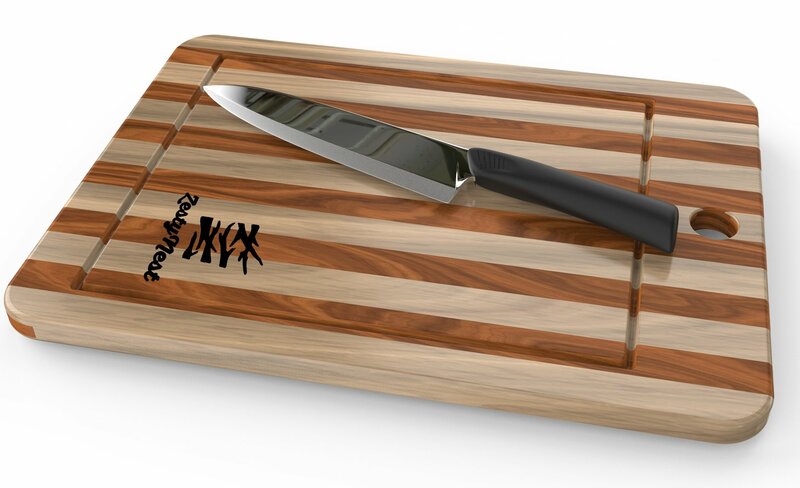 -Premium, stunning striped maple butcher block design. -Hanging cut out for easy storage and air drying. -Four sturdy, non-slip, raised feet. If you're looking for the ideal eco friendly replacement for traditional,large, plastic cutting boards, with natural anti-microbial properties and astunning maple butcher block design to suit every kitchen set, our Moso BambooCutting Board is the perfect choice! Click "Add to Cart" now!